The concept of parameterization is not specific to StresStimulus. It is a well-known technique to make load tests more realistic. Parameterization has two aspects: runtime and design time. 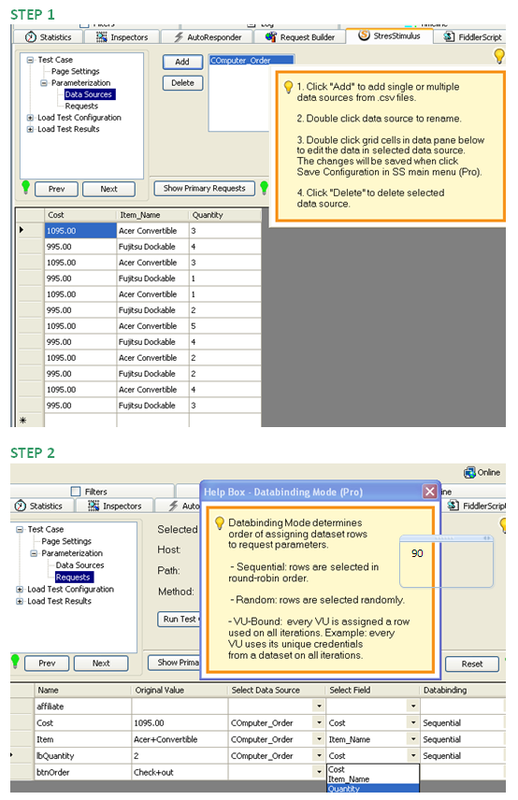 In the runtime, while a load generator replays the recorded scenario, certain recorded value in the request can be automatically substituted by data, which is most often selected from external data sets, according to defined rules. In the design time, a user of a load testing tool actually configures parameterization by defining these rules. 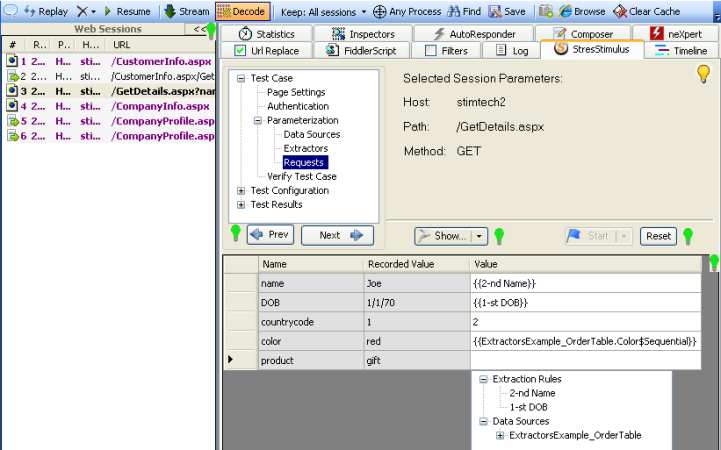 Step 1 - Add datasets; once added, the data set can be used to parameterize any request in the test case. Step 2 - Data bind dataset fields with the request parameters. To do so, display test case sessions in the Fiddler grid, select either a GET request with a query string or a web form POST request. After that, select a necessary field in the parameterization grid and databind it to a dataset field. A brief description of these steps in v1.2 is provided in this post in the answer on the question 2.
v 1.5 introduced a new parameterization control that makes parameterization richer and easy to use. It is described here. Three data-binding methods are described in this post (see item 3). The best way to learn parameterization is to start using it. Parameterize a few fields in a test, run it with 1 VU/1 iteration, and then compare recorded and replayed request to see how the recorded values where changed. I am thankful to you for this information . and its getting very help full to me . Vadim i m getting problem in StressStimulus . i don't know to identify the problem . If I correctly understood your question, when you use the StresStimulus recorder, no sessions appear in the Fiddler grid. If, on the other hand, Fiddler captures traffic fine, then the problem is most likely caused by another proxy (e.g. antivirus) that intercepts the IE traffic on your machine and then forwards it to Fiddler. As a result, filtering in the recorder does not work. In such case, disable the proxy (preferred) or Uncheck the "Filtering" box as shown on the screenshot below.